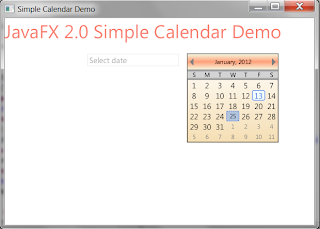 The SimpleCalendar is a combination of two components: A popup container for date picking and a button to display the hidden popup container. The container consist of three blocks. The top block displays the month and the year and hosts two arrows to navigate back and forth between months. The center block only displays first letters of the names of the days. The bottom block displays the days of previous, present and next months. The names are retrieved based on default locale. Since the first day of the week is Monday in some locales it is taken into account. A string bean property (changed to ObjectProperty 28.01.2012) is used to bind the date information. It can be accessible by adding a change listener to the instance of SimpleCalendar. Hi. This is really nice, but how can i integrate it in a fxml controller? Hi, You can declare a HBox or some layout tag and add the Date field(Text Field) and simple Calender in initialize() function in your controller class.